"I want an official Red Ryder carbine-action two hundred shot Range model BB gun!" 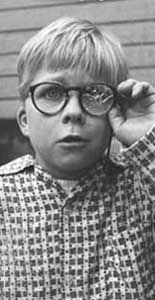 Though, to be accurate, what Ralphie really hit the first time he fired his precious BB gun was his glasses. Had he not been wearing them, he would've had to change his nickname to Popeye. Now that I've refreshed your memory of this beloved holiday classic, I'm going to unveil my own personal heresy, likely to send many of you flying to your keyboards in protest: I really don't care for A Christmas Story. I realize there are many reasons I should like it. For starters, much of this nostalgia-fest could be ripped from my own childish memories of Christmas in New Hampshire: the holiday parade, the department store visits, the whole look of the thing, even the appearance of main character Ralphie, who looks very much like my own primary school self. Even though the movie is set about twenty years before I was Ralphie's age, it gets so much of my formative Christmas experience right that I can call up scene after scene, thirty years after seeing it in a theater in Urbana, Illinois, the one and only time I've watched it all the way through. Knowing this, why shouldn't I have a warm place in my heart for A Christmas Story? In fact, though, I remember leaving the theater disappointed. Yes, I had laughed, uncomfortably, at many of Jean Shepherd's anecdotes. I remembered how it felt to be bullied, the futility of trying to defend my own younger brothers from bullying, the embarrassment of blurting out a forbidden word and having to explain both where I'd heard it and what I thought it meant (though there was no soap-eating in my upbringing), I remembered the unbearable anticipation of the longest, slowest buildup to a holiday there could be. And most of all, I remembered how painful it was to desperately want something, to have that want denied again and again until I had given up all hope of achieving it, then against all odds to realize it after all--and learn that there was no way the reality could possibly live up to my expectations. (Hell, that's an experience I continue to have to this day.) It's remarkable that one piece of entertainment could so perfectly capture all these elements, yet still leave me with a frown on my face. Why wouldn't I want to include this on my list of Christmas essentials? I can answer that question in just one word: redemption. Or, to be more precise, a total lack of redemption. Ralphie wants a BB gun. He finally gets it. As every adult warned him, it turns out to be far more dangerous than he had anticipated. He breaks his glasses. The dog gets the turkey, and the family has Chinese food (along with a painfully racist moment as the restaurant staff sing "Fa-ra-ra-ra-ra") for dinner. The end. Contrast that with How the Grinch Stole Christmas, which concludes with the Grinch realizing Christmas is not about getting, but about sharing. Or A Charlie Brown Christmas, in which our hero, as jaded at first as the Grinch by the commercialization of the holiday, has his own initially rejected effort to prop up an unwanted tree salvaged by the efforts of his friends. Take even such a commercialized property as Rudolph the Red Nosed Reindeer, and at its heart you'll find a powerful message about the hidden gifts of the unwanted misfit. Then there's It's a Wonderful Life, in which George Bailey realizes the true richness of life is in the things one does for others. No discussion of secular Christmas redemption would be complete without the granddaddy of them all, Dickens' A Christmas Carol, and Scrooge's salvation from his own miserliness by three holiday spirits, each of whom shares with him not just the joys of the season, but also the ways in which his own rejection of it is dooming him to a lonely, early death. There is something all these stories have in common: the disillusionment of the central character. Christmas has failed every one of these protagonists. They've all lost the magic--or perhaps realized it was never there for them in the first place. The problem with Ralphie's story is that it ends at the very beginning of that cycle, with his first discovery that getting what you want is just the first step toward the cruel realization that all the packages, boxes, and bags are superficial, that placing all one's eggs in the materialist basket will ultimately leave one cold, disappointed, and alone. That's it, the beginning of the end, with no promise of anything better. The moment of wonder at the pile of gifts under the tree has given way to the mess of torn wrapping paper and the discovery that some assembly is required, that Santa forgot to buy batteries, or that the magical gadget that looked so cool in the TV commercial is a flimsy piece of crap that breaks the first time it's used. What comes next for Ralphie? We'll never know: that part of the story doesn't exist. Maybe it's asking too much of a holiday movie to expect that it will give me hope in humanity--but then again, this holiday is ostensibly about hope coming into the world in an unlikely way, a peasant child born to an unwed mother in a barn. I don't expect this message to be spelled out explicitly (as only A Charlie Brown Christmas does), but I do look for some hint of it in anything I watch, read, or listen to at this time of year. The surprise of the season is not an unexpected toy under the tree, but an insight into the goodness of human nature, the beauty of creation, the value of community, something, anything that makes me feel better about the world around me. A Christmas Story does none of those things, which is why, for all the nostalgic notes it sounds so well, I find it as disappointing to unwrap as a Red Rider BB gun.